This witchy mama needed a tea time break today amid tending to the little ones. Usually I save my tea times at night when everyone is asleep so I can have a quiet time alone with the gods in prayer and meditation, but today I was really feeling the call to attempt tea time in middle of the day. It’s really a great way to spend connecting to whatever deities you work with. Of course, offer them a cup too! a stream of love to you. The animals, the trees, the sand. Where you cannot be free. Is not to Do but is to Be. Create whirlpools, waves and mud. Where the Drought welcomes the Flood. It is rumored that the Seneca Indians may have been the first ones to carve heads out of apples to make dolls and that the Appalachians adapted the custom. Either way, the process is a great way to make a poppet to use in magic. 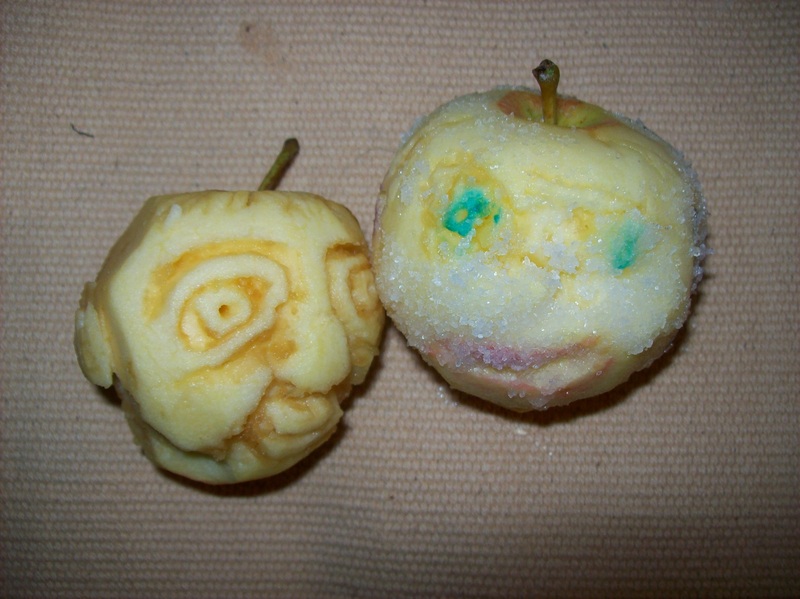 Simply peel an apple and carve out a face while blessing the poppet with whatever qualities that you need. Then soak in lemon juice, cover in salt and let dry in a low-humidity place for three weeks until hardened. The face will dry uniquely, so make sure not to tamper with the face during the process. The facial features will take on a life of their own! There are so many ways to use poppets in magic. 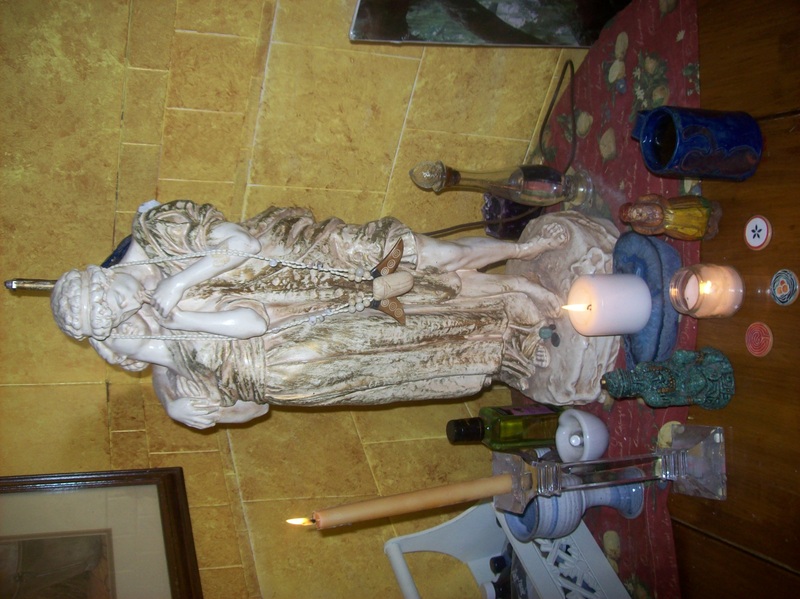 Make sure to thank the poppet when you feel its time is up and retire it in a sacred way. Burn it in the Beltane fires, send it off to sea in a traditional pyre, bury it in a coffin… whatever it wants- just ask! Today my daughter and I made ours. She added marker ink to give it blue eyes, pink lips, purple ears and grey hair. I took the picture after hers was covered in salt but before mine was. Happy Crafting! It is the thread holding all religions together. We all have the passionate desire to feel connected to Infinite Spirit. Although our views differ on who or what the Divine is and our methods vary, we all still have that fervor to be snapped out of our languid existence and feel united with the Great Whole. However, it is impossible for the river to be separate from the valley. We are always connected to the Great Divine. We really do not know what it is like to be away from it. This is how our blindness came about. Is the fish always aware of the water? No, he knows no different. This is something no one can really understand, for we are all so accustomed to being part of the All that there is no way to know anything different than that Connection. Our egos have formed from this non-awareness. Our egos blind the truth. Our egos like to make us think we are separate. Separate as an individual. Separate from the great community of Earth. Separate from the sky and set apart from the animals. A protection mechanism may be one of the ego’s functions. For to take away the blinders is to feel the pulse of the Whole… it would blow our minds. For to feel every joy, sorrow, birth and death would be to expose our thin-skinned hearts to the ardor of All. Religion may be another function of the ego… The thorn on the rose to protect our sensitivities from this awareness. Religion is a map to selectively open our blinders so that the bit of awareness we let in may be catered to our ego’s liking. If God were to offer you a piece of pie, would you agree as long as it were chocolate? Spirituality is spontaneous awareness. The blinders can be removed at anytime. The call of Great Spirit may be heard whenever awareness arises. As a witch, I rebel at order. I want to be awakened in middle of the day. I want to be open to whatever the Divine has to offer me. I’m not sure if I will ever be able to completely remove the blinders, but it is in the spontaneous moments of being aware that I am offered up the Truth of Being and feel that heart-heart beat of the Infinite Spirit of All. 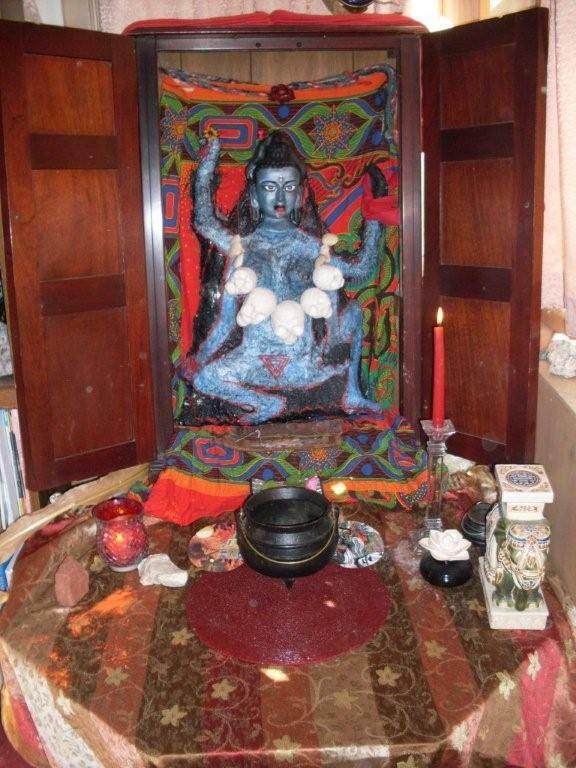 Great Kali Ma, rip me open of my fear of seeing past the illusion my ego has created for me. Open the veil. Open the veil. Open the veil. I know I am safe for You and I can never be apart. I’ve been on vacation for over a week visiting with family in Arizona, thus the long break in writing… but I am back! Tulie has been busy taking care of her infant, but is hoping to write soon. Although I have visited Arizona often, this vacation was the first time that we drove there. 26 hours in the car! But I loved it. Seeing the landscape change gradually had it’s surprising moments like the tiny fuzz of grass in Oklahoma or the random mountains that looked like piles of loose rock in New Mexico. 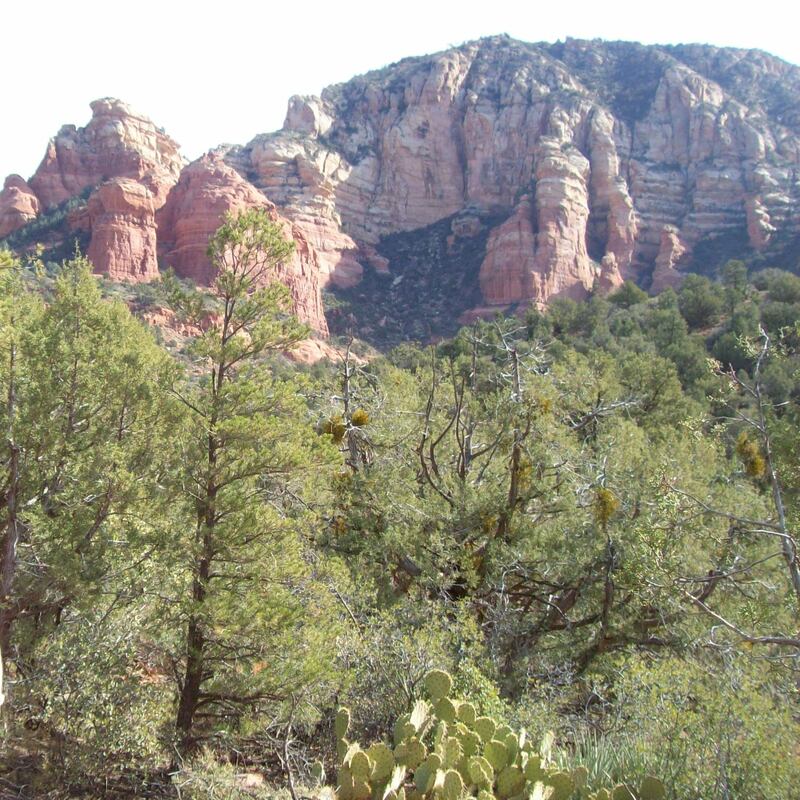 We also go a chance to hike in Sedona. It was stunning there… absolutely beautiful with the red mountains one after another. Our trails were not too steep due to the little ones, but my husband and I plan to go alone for the next trip there, so bring on the climb! We ate at the ChocolaTree, a cafe that serves vegetarian food. We ordered off of the raw menu which was exciting. I like to eat raw whenever possible and so I got to experience first hand the raw sprouted breads. The Kombucha tasted good until my hubby said it tasted like pickle juice. If you are a rock freak like me then you would love Sedona. There are probably around 20 New Age stores there with great selections. I wish I had time to visit them all, but I did get some good shopping in. I bought some red jasper (in accordance with a vision in a dream I had recently) jet, aqua aura quartz, selinite and a big chunk of obsidian. I’m a little weary of how everything was taken from the earth, so I was sure to listen intuitively. 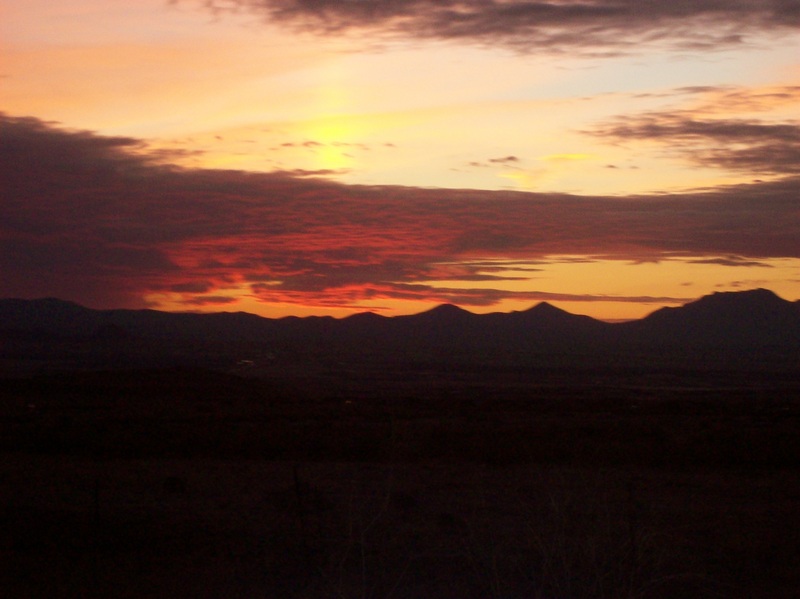 The energy of Arizona is intense and deeply mystical. The desert feels masculine to me, while the forest feels feminine and nourishing. I found it quite easy to slip into trance there. I did this briefly while sitting in a rocking chair in the backyard of my brother-in-law’s next to a pool and under the moon. While listening to Enigma I went through the desert. I feel more connected to the community of the stone people and cactus sages than I do in a shopping mall full of human people. I came across a small stone that begged me to take her home to place her on my heart and solar plexus often. T’eka is an Incan term. 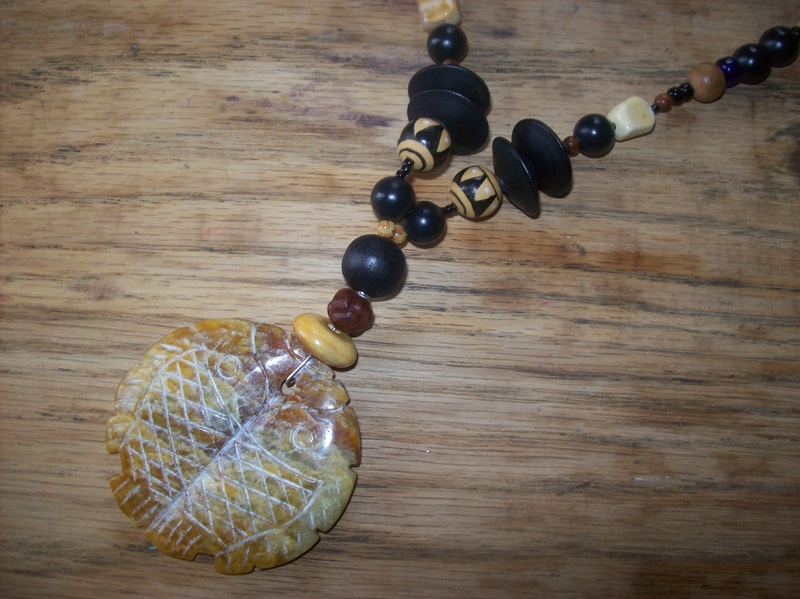 It indicates a special stone that we can work with, learn from and develop personal relationships with. J. Endredy in “Beyond 2012” has good information on them. I am still learning much about her. Like what she likes to be fed? (Smoke) And what kind of relationship we will have. So I am a big fan of Astral Dynamics by Robert Bruce. However, having a life long fascination with astral projection, I read anything that I get my hands on about the subject to broaden my mind about it. Right now I am reading Astral Projection by John Magnus. So far it has been interesting because it discusses more of the philosophical exploration on the subject whereas most books cover the technical implications largely. I have had spontaneous astral projection experiences since I was a child. I never knew what it was because I would suddenly find myself drifting to actual places in middle of the night or waking up with odd sensations zapping through my body. Going from spontaneous projections (which happened rarely) to conscious projections was not a smooth transition, but I have learned it is possible to do. In this new book I am reading I came across an idea that was really interesting and I just had an experience and I now can’t get back to sleep so I am writing! After reading this I meditated and thought about the time I was doing the Corpse Pose after an intense yoga session. This is the pose at the end of doing yoga when you completely relax (I’m not an expert so don’t quote me on this though!) Anyway, one time during this I found that my body was like a shell and my etheric, energy body was able to go through the shell and expand it’s awareness as large as the container of the room. I had consciousness everywhere. Now here’s a theory to ponder: I then thought about this possibility that we are actually everywhere. Imagine you are operating on a certain frequency or vibration and that this is the essence of you. 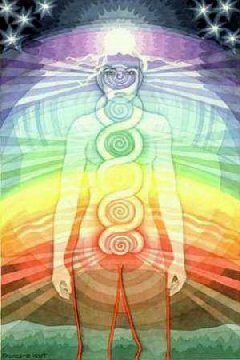 Your body is not so much a vessel for this energy but a physical receiver of this energy so that this energy can have awareness and action in the physical. Being in trance at this time, it was so easy to once again have that experience of being everywhere! My awareness was outside of my body able to freely go wherever it wanted. However, I wasn’t quite used to this. It was like I was shapeless and I didn’t know how to move very well because it felt like I was everywhere. From here I was easily able to feel once more aware in my body and the vibrating energy sensations came easily. (This is the sensation I get when I know my etheric double is ready to do some exploring. It feels like your tingly like when your foot falls asleep, but it’s all over your body.) I projected as the shape of a human and wondered around for a bit. This is always fun because it literally feels like you are walking around. In fact sometimes I am not quite sure when I project if I am actually standing up in my bed physically or not. This question always gets answered when I find that my hand can go through walls, though! Thinking of the body in this way is not too much of a stretch scientifically. Psychologically speaking, sensation and perception deals completely with our bodies sensing physical stimuli (chemicals for taste and smell, vibrations for touch and sound, light for vision) and delivering the message to our brains where we perceive. What if we took it one step further and said that our energy essence was able to then perceive the physical by means of the physical bodies relaying the stimuli for us? I’m not meaning to downplay the role of our bodies in any way, they are truly sacred and spiritually significant, but this is something to consider. Imagine that your essence is everywhere like rays of light and that your body is just accessing a few of these rays, but it can be conscious of the others through this realization. Many ask me what is the point of astral projection? Well for one, it’s fun! You wanna know what it feels like to fly or project in a certain shape? This is a great way to do it. For two, it stretches what you perceive reality to be which is a good practice for anyone who does magic. You can also access the astral plane and find out what energy patterns are hindering or helping you. Just looking into an astral mirror will tell you a lot about your energy body. You can also access the earth plane and find missing objects. The witches’ sabbath is often found in the astral realms and this can be exciting to visit. The list goes on and on.